I’m hosting Easter brunch this year. As if looking through my billions of brunch recipes trying to decide what to make wasn’t enough of a challenge, I’m also putting a cap on how much I spend. Budget-friendly recipes are a must. Can I really pull off holiday entertaining on a budget? I can, if I choose my menu wisely. This year, I’ll skip the expensive spiral ham I usually serve and make a frittata with ham in it instead. That way I can still have ham (what’s a brunch without ham?!) but I can buy it in a smaller quantity. I’m going to keep it simple, but it’s still going to be delicious—I bet my guests won’t even notice the difference. Strawberry-Orange Muffin (32 cents per muffin)We love the combination of strawberry and orange in this sweet breakfast muffin with a streusel topping. For a less conventional (but equally delicious) twist, try the basil variation. The hint of basil complements the fruity berries wonderfully. Prosciutto-Wrapped Asparagus (84 cents per serving)These prosciutto-wrapped bundles of grilled asparagus are a delicious addition to a spring brunch or elegant dinner. Couscous, Lentil & Arugula Salad with Garlic-Dijon Vinaigrette ($2.17 per serving) This hearty combination of whole-wheat couscous and lentils perched atop a lightly dressed bed of arugula makes a tasty vegetarian main-course salad. The lemony vinaigrette is especially good for bringing out the spicy notes of the arugula. 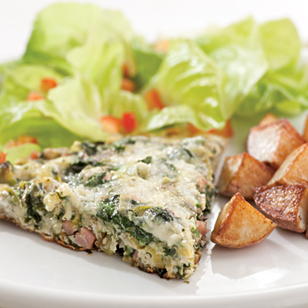 Green Eggs & Ham Frittata ($1.14 per serving) Our version of green eggs and ham is full of spinach, leeks and dill, along with ham and havarti cheese. Serve with: Roasted red potatoes or hash browns.